Activa GS is a slurry only preparation of transglutaminase. 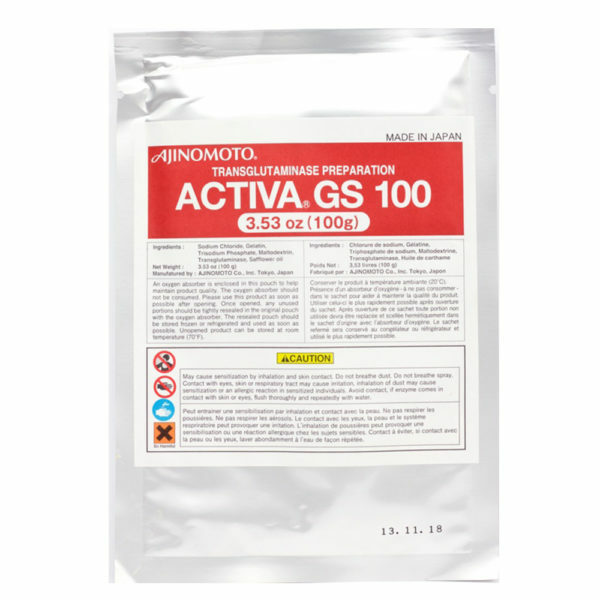 This preparation was designed for gluing large pieces of muscle together, and contains pre-hydrated gelatin to aid in a stronger bond with your products. The ratio to use is 4:1 water to Activa by weight. If you require a thicker slurry application then reduce the ratio to 3:1 water to Activa by weight. Simply whisk in to cold water, and allow at least 10 minutes to rehydrate. Paint over your meat! A little goes a long way, as this is a very powerful preparation. Always freeze your Activa packet once you’ve opened it. This is a live enzyme, and will degrade if kept at higher temperatures. To assure that your bind will always be strong weigh out what you need, then immediately place it back in the freezer. Once opened, and if kept in the proper storage conditions we have noticed a shelf life of 6 months.